The fruit of my labor is finally being published! The following series of blog entries is the result of the final capstone research paper for my International Studies major at North Dakota State University. I graduated from NDSU with a Bachelor of Arts degree in Management Communication and International Studies with a minor in Spanish. International Studies is a secondary major designed to provide a more global perspective to your primary degree track and career goals by taking additional courses with an international focus, and studying abroad. The objective of the capstone paper is to select a topic that combines your anticipated profession with your study abroad experience and primary major. The series of events that led me to my topic began two years ago. In January of 2015, I traveled to Amarillo, Texas for an internship with the American Quarter Horse Association (AQHA). Because of my hard work and passion for horse racing, I was enlisted to work at the 2014 AQHA Racing Champions Announcements and Heritage Place Winter Sale in Oklahoma City with Andrea Caudill, editor of the AQHA racing magazine, Quarter Racing Journal. Interested in applying my Spanish skills during the experience, I was intrigued when she asked me to join her in a bilingual interview with Mexican horse breeder, Anselmo Aguilar. Andrea did not speak Spanish, so she spoke through an interpreter to learn about his transition from doctor to businessman, and now horse racing enthusiast (Caudill, 2016). I had the opportunity to speak with Aguilar after the interview about my aspirations for improving my Spanish and studying abroad. The concept of Latin American involvement in the U.S. horse racing industry fascinated me, and the prospect of combining my love for the sport and speaking Spanish prompted me to investigate. My interest has always leaned toward Thoroughbreds, so when I returned to Amarillo I searched Google for countries with active Thoroughbred racing industries. In February of 2016, I packed my bags to study abroad in Viña del Mar, Chile, with the intention to learn and become involved in Chilean horse racing. 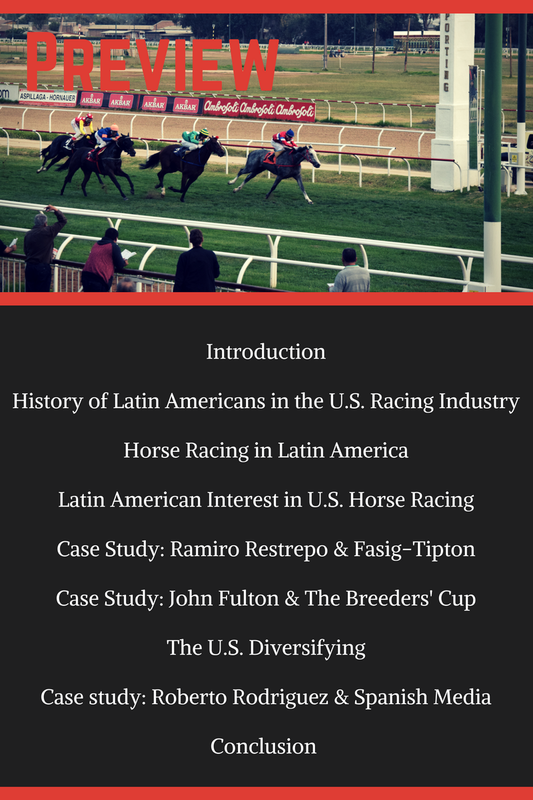 What influence have Latin Americans had in the United States horse racing industry? In what ways are Latin Americans becoming involved in the business culture of U.S. horse racing? Has there been a reason for the recent increase in Latin American involvement? What is prompting their interest to invest and be involved in U.S. horse racing? What is the United States doing to influence and facilitate the involvement and/or investments from the Latin American demographic? Caudill, A. (2016, August). Luck, Dedication and Success: Anselmo Aguilar is a perennial leading breeder and owner. Quarter Racing Journal, 17-19.